. :: GLOBAL CHAMPIONS TOUR DOHA, QATAR - COURSE DESIGNING CHALLENGES ::. Leading international course designer Frank Rothenberger, from Germany, will provide the challenging courses for the first leg of the 2011Global Champions Tour to be held at the Qatar Equestrian Federation Outdoor Arena in Al Rayan, Doha from March 17th to March 19th. Since the beginning of 2011Frank has had a busy schedule in his capacity as course designer including the build at the CSI5*-W Zurich, Switzerland where the World Cup event saw the success of German top show jumper Marcus Ehning, champion of the Global Champions Tour in 2010. 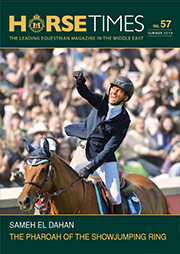 Recently the Global Champions Tour discussed with Frank the forthcoming challenges presented as the official course designer for the first leg of the tour in Doha which is only four weeks away. GCT: Compared to other 5* competitions what challenges does course designing for the Global Champions Tour bring for you? Frank: The Global Champions Tour features the best of the best in terms of riders, prize money, venues and organization. I have to be at the top of my game in order to present the best challenges to these top world listed riders. This is a very important event at this time of the year and I have to be very careful in terms of which building techniques will be better utilised. For the majority of the horses competing at this show it will be the first outdoor events after a long winter of indoor competitions. I must be steady in what I present to them as a challenge in order to keep them confident outdoors and ready to face the next competitions. GCT: This is the first time that you will build in Doha with its round arena. What does this bring to your strategy for course designing? Frank: I was lucky enough to be in Doha three years ago as a spectator, where I was able to get a feel of the arena and have some thoughts on how I would go about course designing here. In particular with Doha the size of the arena is special in terms of its round shape and its huge dimensions. There are no fixed permanent features such as water jumps or mounds to use as focal points. It is a big challenge to build in such a big space. Most of the times when you are building courses you have the opportunity to position the jumps close to the arena confines however in this arena that is not always possible so the challenges are there. This special arena does provide me with many possibilities to be creative in other ways. GCT: What input have you had in developing the fences for the Global Champions Tour event in Doha? comfortable in knowing that the quality of the equipment will be good. There are times when I need to take my own equipment to events and that is easy for me as my company build fences. In Doha my expertise will be focusing on designing and construction of courses. GCT: As Doha is the first leg of the Global Champions Tour what do you have in mind in regards to fence construction and course design? Frank: Before I start to design for the Global Champions Tour in Doha I will look at the list of horses that are coming to the event and plan the build accordingly. I know the horses and riders and it is my expectation not to hit them too quickly with difficult tasks. The first day I will build a course aiming to get the horse confident jumping in a large outdoor arena where they have to cover more ground. From there I can see how they handle things and develop further technical aspects such as height, spread and distance challenges through to the final Global Champions Tour Grand Prix on the Saturday night. GCT: Is there a particular theme or look you have in mind for the arena? Frank: My plan is to know the equipment or fences that are available to me, develop my course designs and then to work at the creative flair for arena ambiance. This will all take place once I get to Doha and inspect the arena and facilities. GCT: Since 2006 you have course designed at thirteen Global Champions Tour events but never in Doha. What are you personally looking forward to in Doha? Frank: Some years ago I course designed at the Arabian Equestrian Games. At that time HRH Princess Haya Al Hussein was competing as a 20 year old and I know Doha from that era. These days Doha has developed into a cosmopolitan city with the landscape now including many wonderful architectural developments. I am looking forward to seeing Doha as it is today with the blend of Middle Eastern historical culture and the new era. 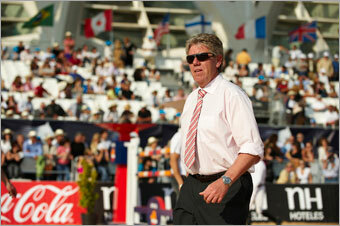 GCT: What other 2011 Global Champions Tour events will you be course designing at this year? Frank: My year is certainly looking full in terms of commitments but to the fore is the Global Champions Tour where I will build at Valencia in Spain, Hamburg in Germany and Estoril in Portugal. Aside from the Global Champions Tour I have taken commitments to course design at Paris, France CSI5*, at the World Cup Final in Leipzig, Germany in May, and at several German events including Pforzeim, CSI3*, Norten Hardenberg CSI3*, and Balve CSI3* , Sao Paula, Brazil National Championships, the test event for the London Olympic Games and then CHIO Aachen. After that heavy schedule I will be taking four weeks holiday before facing the latter half of the year. While Frank will go on to course design around the globe after Doha, he will meet up with the second leg of the tour to be hosted in Valencia, Spain from the 6th until the 8th of May 2011. The Global Champions Tour 2006-2010 - Frank Rothenburger course designing and the winners.